Spurzheim in Boston, Mass, 1833. Spurzheim (centre with clasped hands); this engraving was described by his son-in-law as particularly accurate. A Lutheran farmer's son from Longuich near Trier, Spurzheim was, like Gall, originally intended for the clergy. Spurzheim studied divinity and philosophy at the University of Trier but he fled to Vienna in 1799, purportedly to escape the invading French. In Vienna Spurzheim studied medicine and supported himself by tutoring a nobleman's children. Gall was the nobleman's physician and this is how Gall and Spurzheim first met in 1800. Spurzheim attended Gall's lectures avidly, and was eventually allowed to attend gratis until they were interdicted in December 1801. Beginning in 1804 Spurzheim was employed by Gall as dissectionist and famulus. Spurzheim accompanied Gall in this roll on the latter's triumphant European lecture tour 1805-7. In 1808 when Gall composed a Memoir of his anatomical discoveries to the French National Institute in Paris, he added Spurzheim's name to the title page, planning to prepare Spurzheim to be his successor. In 1810, Gall published the first of a four-volume work on his system. The first two volumes also bear the name of Spurzheim. Spurzheim helped with comments and notes and arranged the illustrations, but the text was Gall's. In 1812 or 1813 Spurzheim and Gall had a falling out which has yet to be fully explained. Spurzheim travelled to Vienna where he completed his medical degree in 1813 and then travelled to London, arriving in March 1814. He lectured on what he termed 'Drs. Gall and Spurzheim's physiognomical System' and in 1815 published his first book. Spurzheim made many alterations to Gall's system. In The Physiognomical System he boasted: "This book itself will show how much I have improved our doctrine in the last few years" because the system "must assume a more scientific arrangement, and be considered in a more philosophical manner, than Dr. Gall has been accustomed to do in his lectures." Spurzheim increased the number of organs from twenty-seven to thirty-three and changed the names of several. (see the Organs page) Spurzheim also arranged the faculties into a hierarchical taxonomic system of two orders and five genera ascending from organs common to man and "lower" animals, such as Philoprogenitiveness, the love of offspring (starting at the back of the head and moving forwards), organs of "the moral sentiments" some of which were shared by Man and animals and other "intellectual" organs peculiar to Man such as Veneration, Size, and Language located in the forehead. Spurzheim was the first to publish the image of a head to illustrate the craniographic layout of organs. Gall and his admirers on the continent had all produced images of skulls with organ markings but Spurzheim chose a representation more palatable to a lay audience, less technical and more easily applied to head readings. 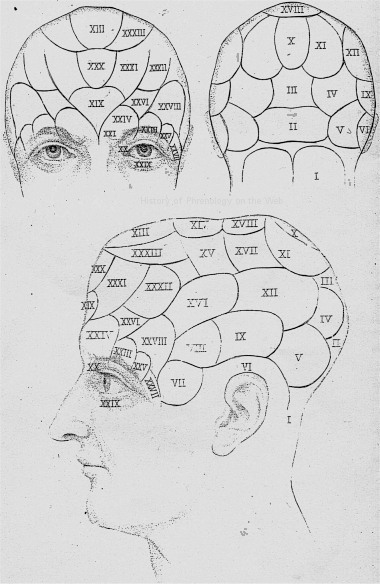 Spurzheim's images, and terminology, became phrenology. While lecturing in Dublin Spurzheim first read the June issue of the widely-read and respected Whig Edinburgh Review which contained a damning review of his book and Gall's system in general. All was dismissed as "a piece of thorough quackery from beginning to end". Although anonymous like most articles of the time, the authorship of this ironic and calumnious review was not long concealed. The reviewer was the anatomist Dr. John Gordon (1786-1818) a former student of John Barclay and Dugald Stewart and since 1807 an extra-mural lecturer on anatomy and physiology in Surgeons' Square Edinburgh. Gordon, ten years Spurzheim's junior, was an aspiring man. The son of a banker and wine merchant, Gordon had risen through the ranks by talent and patronage, especially from his teacher Dr. John Thomson, Regius Professor of Military Surgery. In 1808 Gordon was elected a fellow of the Royal College of Surgeons and in 1812 a fellow of the Royal Society of Edinburgh. 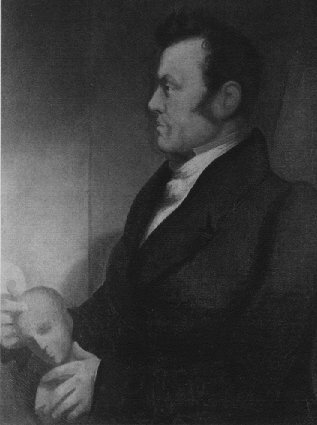 The review made Spurzheim's name in Britain and in 1816 Spurzheim travelled to Edinburgh where he famously refuted Gordon in his own lecture theatre by dissecting brains before large audiences. The controversy in Edinburgh led to the conversion of the first zealous proselytises for phrenology. Dr. Spurzheim sank not under this cruelty of criticism, which he bore with a serenity of deportment worthy of a man of science. On the contrary, his moral character appeared more bright in the eyes of those who knew him, simply by being contrasted with the foulness of the epithets that had been thrown upon it. He came to Edinburgh, therefore, not to indulge feelings of personal irritation, but in a spirit of meekness, anxious to find out his opponent, for no other purpose than that he might convince him, by ocular demonstration of the peculiar structure of the brain which he had described in his works and plates. I had the good fortune to be present at his first demonstration, which took place before a considerable number of eminent anatomists; the person also was there who rumour alleges to be the author of the offensive article in the Review. I marked the conduct of that individual, and if the outward deportment could be viewed as an indication of what was passing in the mind, he was certainly labouring under suppressed emotion; and more than once tried to disembarrass himself by pulling from his pocket and reading, or pretending to read, the superscription of a letter. He generally contented himself with distant hurried glances at what was demonstrated, and upon the whole seemed both uneasy and inattentive. I am the more minute as to these facts, because he has since alluded to this demonstration as being by no means satisfactory; he was probably, however, the only individual to whom it was not satisfactory. Attempts have been made to misrepresent the feelings and judgment of the audience, which were unquestionably in favour of Dr. Spurzheim, in the proportion of at least twenty to one. It would have been too much to expect perfect unanimity on a question and an occasion of this sort. Since this notable occasion, Dr. Spurzheim has dissected the brain before the Royal Physical Society, and repeatedly to mixed audiences; and it is but bare truth to say, that I do not know any man of sense or candour who does not bow to the correctness of his pathological views, and admire the beautiful accuracy of his demonstrations. I conclude by saying, that I have no connection with Dr. Spurzheim, and he knows nothing of my having taken this step. To my respect, as to that of every other man, he is entitled by his superior talents as well as his excellent and amiable character; but upon me he has no particular claim, save that which I am ever ready to allow to injured merit. 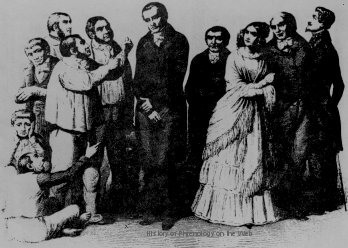 In 1817 Spurzheim returned to live and lecture in Paris where he married a French widow in 1818. In 1825 his lectures were banned and Spurzheim returned to Britain where he took up residence in London. He published many books (see my bibliography) and took part in further controversies over phrenology, especially with Sir William Hamilton, professor of Universal History in Edinburgh. After the death of his wife in the winter 1829/30 Spurzheim travelled more frequently from Paris, to Dublin, then Belfast back to London and to Paris. In 1832 Spurzheim travelled to the United States of America where he conducted a highly successful lecture tour. Unfortunately for Spurzheim, his zeal in earning money and love of fame prevented him from suspending his lectures when he became ill and he died in Boston in 1832. 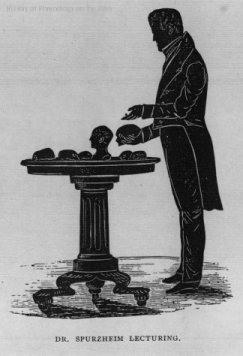 Although Spurzheim assiduously spread an false version of the history of phrenology, one in which he played a partnership role with Gall in the creation of the system, Spurzheim was the man most singularly responsible for popularising and spreading phrenology to a wide audience. *Anglo-American historians very often give Spurzheim the erroneous middle name of Christoph. See for example the Dictionary of Scientific Biography. There is no doubt that the correct name is Gaspar. It is on his parish birth record, and all of his publications and letters are signed with G. or J.G. Spurzheim.